Most ebooks formats feel like they’ve been designed and coded by someone who’s never read an ebook, let alone written one. Not only has Dave Bricker written novels and a memoir, The Blue Monk, but he has published them all on his own platform. In this week’s Author Pitch, he tells us about what he’s done that warranted chronicling and how that changed the way he lives his life. I’ve been a graphic designer since I bought my first Mac back in 1987. I earned my MFA and taught design at a university level for over 13 years. In 1995, I incorporated my studio. Someone asked if I built websites so I bought a how-to book. The web has been my playground ever since. In 2007, a writer contracted me to produce his three novels. I fell in love with book design, and the process inspired me to write five of my own. I polished my wordcraft, started blogging about publishing and developed a book coaching practice that helps remarkable people tell remarkable stories. Most recently, I developed better eBooks that don’t look like DATA. I created my own web-based platform (PubML™) and a set of tools that help non-designers create beautiful eBooks. The format is open-source; publishers now have a non-proprietary distribution channel that’s competitive with commercial ones. Tell us about the experiences you describe in your memoir, The Blue Monk. What made you sit down to write it? When I was 18, I fell headfirst and backward into a floating community a half-mile out on Miami’s Biscayne Bay. I was warned about the “derelicts, addicts, and thieves” of Dinner Key Anchorage, but I encountered a group of talented, self-reliant people. By the time I graduated college, I was living aboard my own 26-foot sloop, The Blue Monk, in a floating “Tortilla Flat,” a true-life storybook full of comedy, tragedy, mythological characters, and colorful settings. Inspired and encouraged by my anchorage neighbors, I made a series of unfunded voyages that took me up and down the Bahamas and across the Atlantic through the Azores to Gibraltar. After I returned to pursue “normal” things, I wanted to honor my experiences. I wanted to document an unwritten piece of Miami’s history. As a writer, I wanted to try my hand at capturing the essence of the deep solitude, grand adventure, rich color and transcendent beauty of those experiences. I like different writers for different reasons. I love Melville and Dickens for their Victorian facility with language. Joseph Conrad’s native language was Portuguese and yet, his English prose is masterful. Steinbeck’s colors are inspiring. Robert Penn Warren was brilliant. Saint-Exupéry is poetry in prose. Most of the material I enjoy was written before I was born. You can’t beat the classics, but nobody crafts a metaphor like Tom Robbins. I read a bit of everything. When I was sailing, I often read a book a day. But since I began working with writers, I spend so much time deep diving into clients’ books that my recreational reading has declined. I enjoy mountains of quality reading material but little that’s on the public radar. I just finished producing a wonderful, quirky love story by Barbie Taylor and George Walther called Honey, I’m Home! that’s going to make a lot of people smile. Forget your preconceptions about love stories; this one defies categorisation (even men will like it!). That’s what indie publishing is about. What’s the best memoir/autobiography you’ve read? I would have to say Wind, Sand and Stars by Antoine de Saint-Exupéry, a beautiful portrait of life as a pilot flying mail across the mountains in a small open plane. Good memoir transmits the thoughts, feelings, and experiences of the author to the reader. Saint Exupery’s poetic and transporting masterpiece is worth savouring and studying. Bernard Moitessier’s The Long Way likewise exemplifies the “experiential” writing that inspires me. You’ve also written three novels. Do you find it easier to write fiction or memoir? When I’m inspired to write, I just write. The initial writing is easy; the editing and polishing are slow, demanding, and meticulous. My novels are based on a friend’s true stories. They emerged as fiction because I needed to deviate from his accounts in the service of better storytelling. And some of the truth would have been difficult for readers to believe. The fictional version honoured the stories without compromising the storytelling. Though memoir is considered “nonfiction,” two witnesses to the same event will give different descriptions. Truth is an unattainable absolute. Life does not occur in tidy chapters that flow into an elegant story arc. The Blue Monk is based on my own true stories, but it isn’t a journalistic record of facts. Whether writing fiction or memoir, I strive for authenticity over factual accuracy. The writing process is identical for me. Both contain appropriate measures of fact and fiction. Do readers have to be interested in sailing to enjoy The Blue Monk? Definitely not. Though cruising sailors and Miami boaters will recognise some of the settings, the story begins at a time when I knew nothing about sailing and the lifestyle associated with it; I assume my reader is likewise in unfamiliar territory. The narrative carries the reader into my discovery of the nautical world, and it includes about a hundred footnotes to explain the nautical terms. If anything, The Blue Monk was written for people who have never sailed nor even slept under the stars. It’s a book about living fully and facing fear—themes that are important to all of us. What life lessons can readers take away from your book? When I went sailing, I experienced something larger than being “a kid on a boat alone in the islands.” It doesn’t matter what that “something” was—I’m not interested in influencing my readers’ spiritual beliefs or in sullying a transcendent experience by analysing it. I like the idea that someone might read my book and decide to do something they’d otherwise be afraid to. That might be sailing solo or it might be singing in front of other people or sleeping in a tent. Beyond the grid, beyond “the land of clocks and calendars,” lies a magical world of possibility. Too many people think adventures happen only in movies. An adventure can be as grandiose as climbing Mt. Everest or as tiny as mustering up the courage to ask someone attractive to dinner. If you’re not afraid, you’re not living; you’re not challenging yourself to leave your “safety zone.” When you realize that 99% of the things you’re afraid of are “what if” scenarios created by your own imagination, you free yourself to live. People are surprised to hear I was afraid every time I sailed that boat by myself. Fear is natural but it doesn’t have to paralyse us. How would you describe The Blue Monk in a Hollywood Pitch? The official summary: In 1989 Dave Bricker set off across the Gulf Stream in a small sailboat with $30 in his pocket. His voyages aboard The Blue Monk through the Bahamas and across the Atlantic to Gibraltar are recounted in vivid prose. 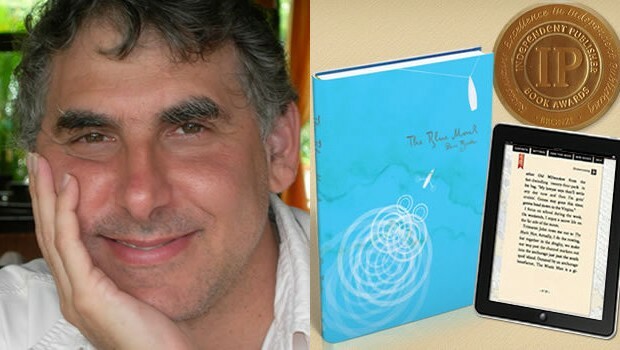 The Blue Monk is a journey of self-discovery set in a world of saturated colours, remarkable people, hazardous reefs, and transcendent beauty. Bricker chronicles a little-known fragment of Miami’s history and encourages us all to embrace a world of power and magic that lies only a few steps off the sidewalk. The summary is a concise description but a useless pitch. I attempted to write an exquisite book, but I never tried to make it appeal to Steven Spielberg. If I was a movie producer, I’d want The Blue Monk on my night table, but it lacks the “fall and redemption” backbone that 90-minute on-screen storytelling depends on. Therein lies its strength or its weakness depending on what results you value as a publisher or as a reader. Look at a beautiful print book. Then look at an ebook. The ebook looks like data. Ebooks don’t meet the standards of serious authors. Ebooks are based on the same code that websites are, but the web browser offers more flexibility to embed web fonts, and pull content from YouTube, Google maps and image hosting services. I believe the open web is the most flexible and powerful ebook platform. Because most writers aren’t coders, I created a set of web-based e-publishing tools. The PubML tools convert WordPress into an intuitive, easy-to-learn ebook publishing platform. They also export ePub files for writers who want to leverage traditional formats and distribution channels. The PubML version of The Blue Monkincludes 100 photo footnotes, 80 maps, 200 images, and 350 video clips — none of which compete with the reading experience.